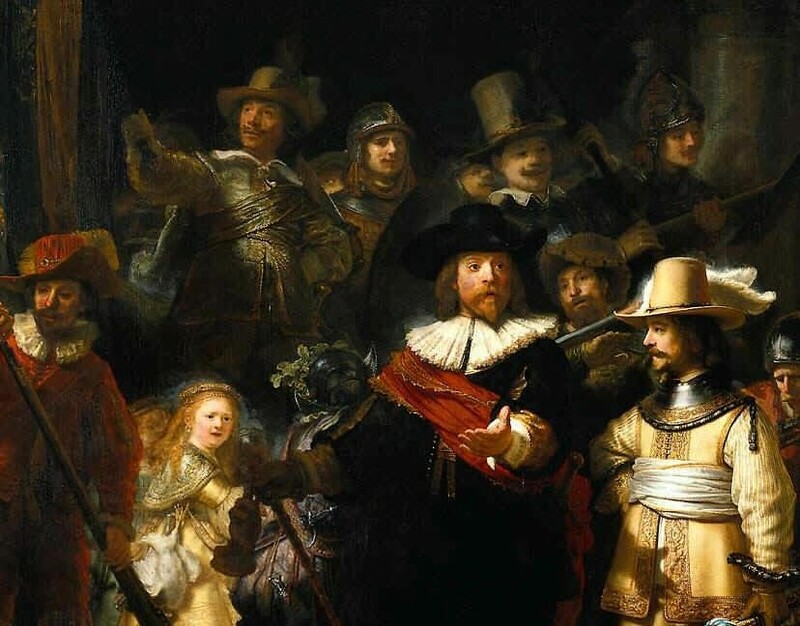 Exactly a week ago, on 9 November 2015, Chiever filed an application to register Rembrandt’s painting The Night Watch as a trade mark with the Benelux Office for Intellectual Property (BOIP). The reason for this was not claim any rights for the Night Watch but just to get hold of a nice reproduction of this iconic work to stick on the office wall. The application was filed in respect of “strontium” in Class 1 of the Nice Classification. There was an ulterior motive for this application too. 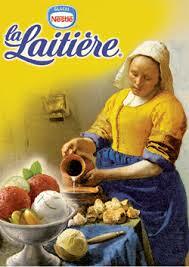 It would ideally provide an answer to the question whether European trade mark law allows the registration of famous old painting as trade marks (if you look in the Benelux register, you will spot that Nestlé has already got there with its Vermeer milkmaid, left, and Manpower has its Leonardo da Vinci drawing, below right. Both were registered a long time ago, at a time when BOIP was not yet allowed to check applications on absolute grounds). So the question was whether BOIP would accept the registration of The Night Watch, or is a painting of this kind just too complex to be a trade mark? We don’t think so, since it’s eminently recognisable. But might it be refused because such a trade mark is thought to be contrary to public order or the principles of morality? We would be surprised if that were so. ‘Will the Night Watch application come to registration? We are already preparing the canvas’. 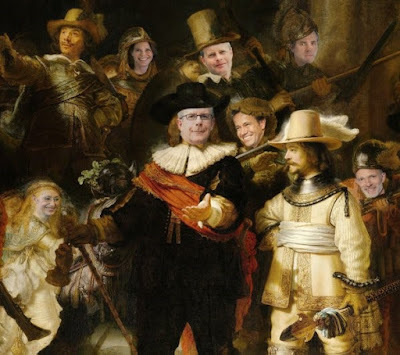 The tweet was accompanied by a photo-shopped Night Watch, in which you can recognize not only our firm’s management team but also the Board of Directors of BOIP. 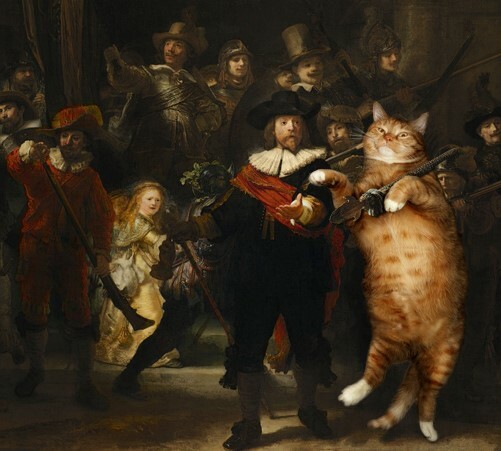 This Kat recalls that this is not his friend's first foray into slightly mischievous trade mark matters. Readers may remember Case C-283/01 Shield Mark NV v Joos Kist, trading as Memex, in which it was not Rembrandt who provided the cultural content but Ludwig van Beethoven. I have to wonder if the Benelux Office for IP will be making use of the services of one of the industrial painting reproduction outfits such as 'Painting Star' in China when providing the painting of the trade mark? Painting Star is an example of a company which has recently caused some consternation amongst the UK museum/gallery community by selling copies of notable works of art, thereby infringing the original artistic copyright in some more recent works, and/or photographic copyright (e.g. the copyright in the digital 'surrogates', in particular of older works for which the artistic copyright has expired, but where a digitisation program has resulted in a new work). The objection is clear. It is not a trade mark at all. The applicants do not deal in strontium, never will and have no intention of using the mark in trade for anything. The fact that EU TM law as currently operated may allow this sort of thing brings it into disrepute. If only a case as clear as this could get to the CJEU it might see some sense.